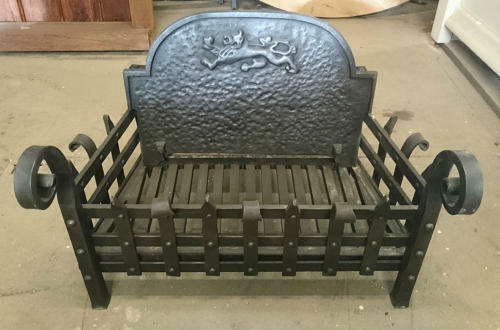 A fantastic quality, large, reclaimed cast iron freestanding fire basket with fireback. The basket is hand forged and has beautiful scrolling finials. The fireback is a reproduction of an early lion motif and has been blacked and polished giving a rich colour and finish. There is a good deal of burning space and the grate is heavy and solid. The item is reclaimed and therefore has some signs of use and wear. There are some slight patches of surface rust, tarnish, scratches and marks. The back originally had a fire brick and is now broken and uneven. It can be seen from the back but once installed the fireback covers the broken brick. A very pretty firebasket, that has been finely made, and would add great style to a hearth. The basket is of a good size and therefore would be perfect for a kitchen, living or dining room.